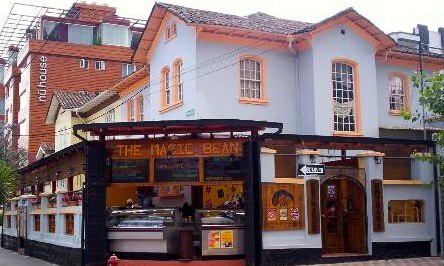 On the first day, at 7.00am, we met our group at a restaurant called Magic Bean — great place to have coffee and breakfast. After quick meet and greet, we realized that we had a very diverse group of people coming from countries like Canada, Poland, France, Netherlands, and the UK. Our guide was an awesome guy, Fernando, who was fluent in Spanish and English. In this trip, we also met Roberto who was the owner of the company. 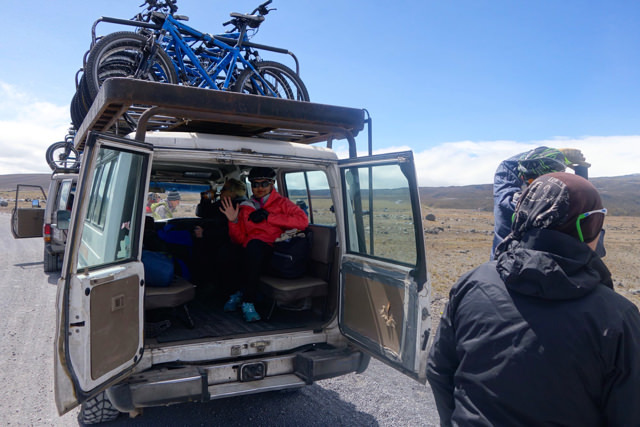 He was an enthusiastic guy.Later, Fernando gave us a quick briefing about the plan for the next 3 days and then we boarded into two jeeps for our first destination –Cotopaxi National Park.We drove on a nice sunny day for 1.5 hours and reached the Cotopaxi Park entrance. 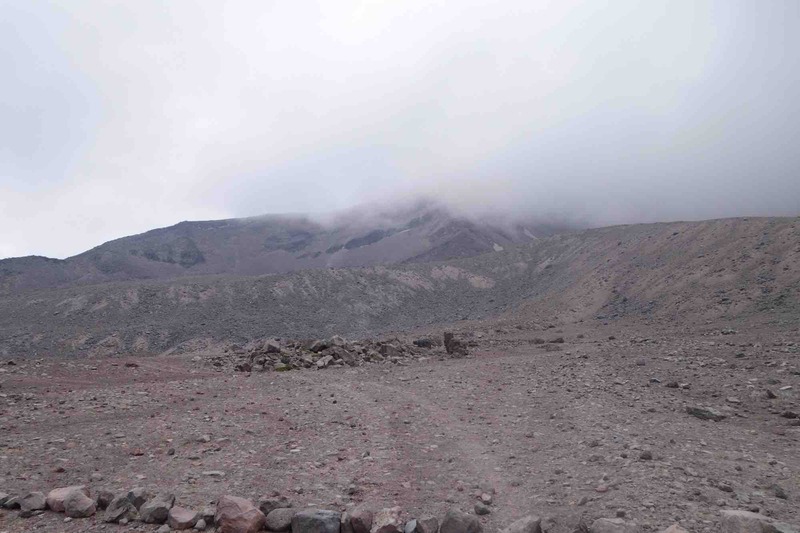 It was really cold and windy when we reached our starting point at Mountain Cotopaxi, at around 4500 meters. 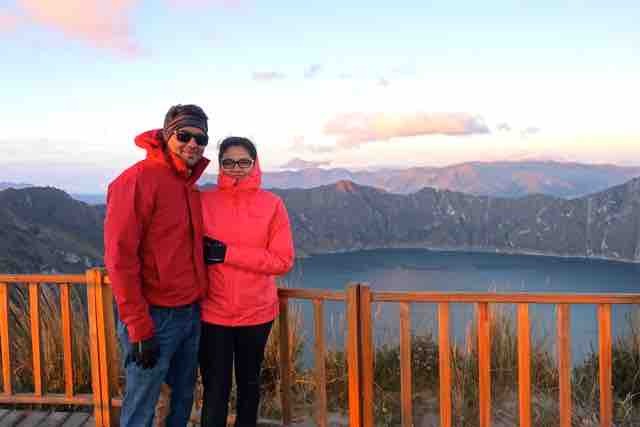 But the view at that point was simply breathtaking.We wore our helmets, protective gears and layers of insulating clothes, got our bikes and were ready to start our adventure! Our first 8 km was biking downhill through volcanic ash and rocks. In my opinion, it was the toughest part of the ride as it was steep with rocks everywhere. It was not that easy as I thought and took me a few trials to get it right. I had ridden a mountain bike earlier but riding it on an actual mountain was different and challenging. 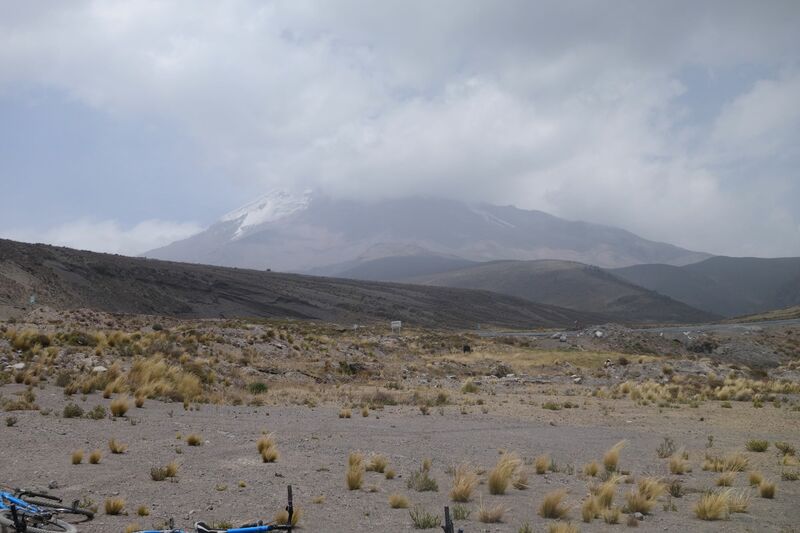 Mountain Biking Chimborazo from shuchimuley on Vimeo. Once everyone finished the first part, we rode for another 8kms, this time on a flat green terrain where we saw few horses running in the wild. Cotopaxi Biking from shuchimuley on Vimeo. After completing our 16km ride, we took a break for lunch. We had awesome home made pasta with orange juice and cake. It was delicious! Our lunch spot was a small picnic area with some greenery and a nice view of the mountain. We also saw a white eagle hunting down its prey. During lunch, we got to know our group better. 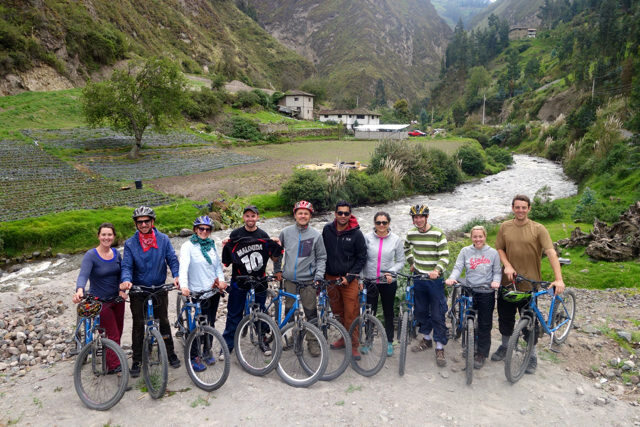 There were a lot of active travelers in our group who had traveled most of the world. It was great knowing more about different cultures. After lunch, we were ready for another 16 km ride. This time the terrain was rough land with some hills, vegetation, and sand. 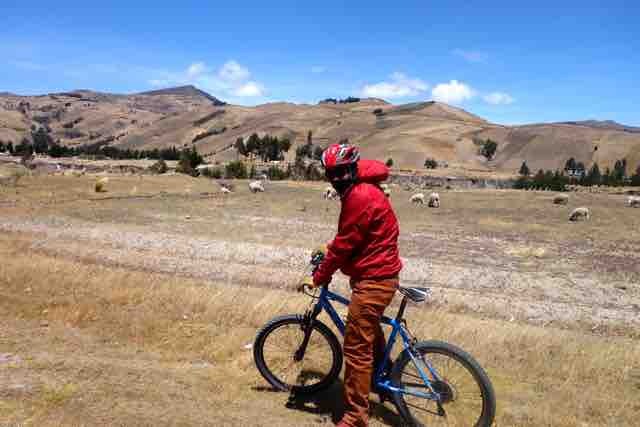 Riding uphill was tiring but the views were really motivating and we were up for the challenge. 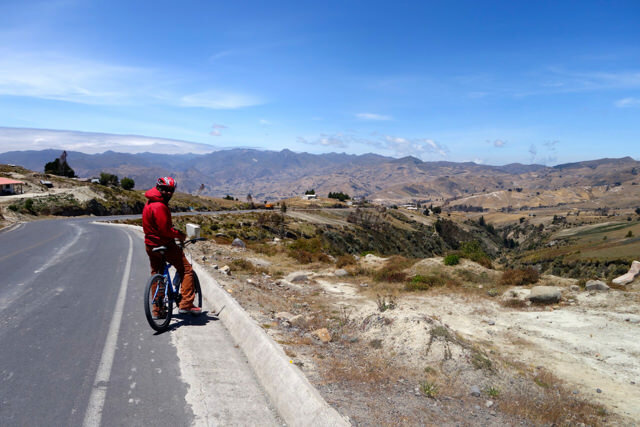 This was the last part of our ride for the day and we put our bikes back in our jeeps and drove to Quilotoa to spend the night. 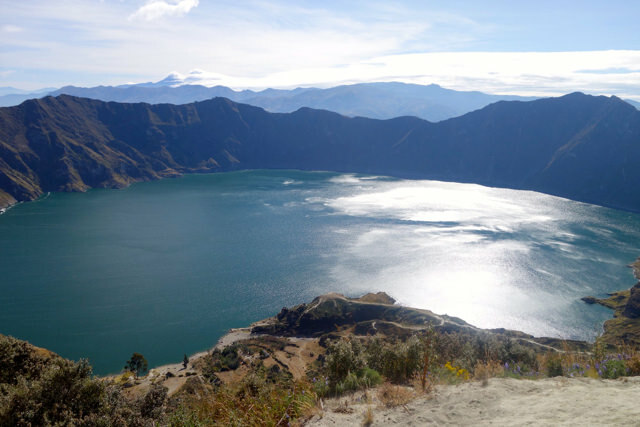 Quilotoa is a water-filled caldera and a volcano in the Ecuadorian Andes. 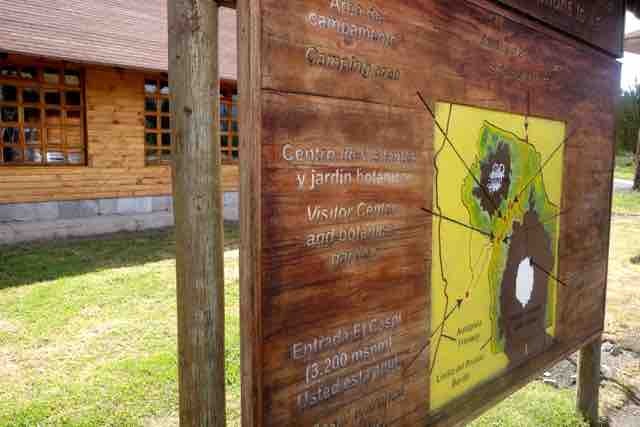 It was formed from the collapse of land after the volcanic eruption. On our way to Quilotoa, we stopped at a local market where Fernando and Roberto showed us different varieties of fruits and vegetables. 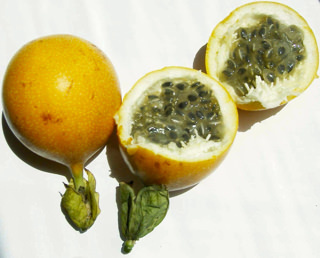 We all tried out different fruits — one of Saurabh’s favorite was Granadilla which looked like booger from inside but tasted really good.We also tried fruits that were local to Ecuador such as Pitahaya, Pepino, Chirimoya, and Orito. It was fun meeting the locals and trying out new stuff. 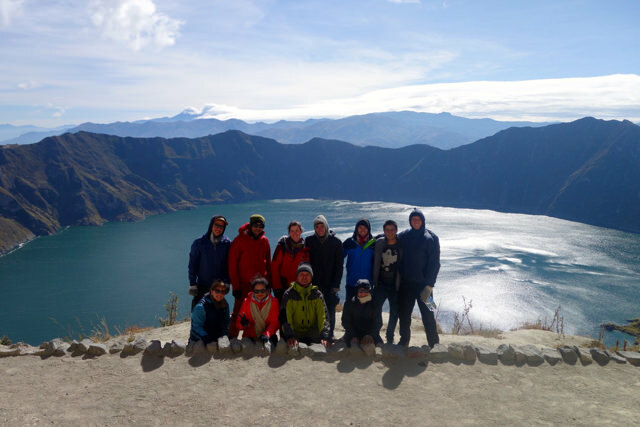 After driving for another 45 min, we reached our hostel in Quilotoa. We reached at the perfect time for sunset and the views over the lake were very beautiful and amazing. This place was at least 5ºC less than Cotopaxi and was cold and windy. Our hostel had a very nice fireplace where we all gathered and had passion fruit tea with Aguardiente (alcoholic beverage derived from sugarcane). As we were waiting for our dinner, some of us went outside and it was pitch dark. The stars were looking amazing in a clean and pollution free environment. Finally, our dinner was ready where we learned that Ecuadorian food usually had a 3-course dinner – soup, main course, and dessert. We started with a hot bean and potato soup with popcorns. It was so good that I had it twice! Our main course was rice and vegetables and cheesecake for dessert. After a long day, all we needed now was to have some sleep before our next day. 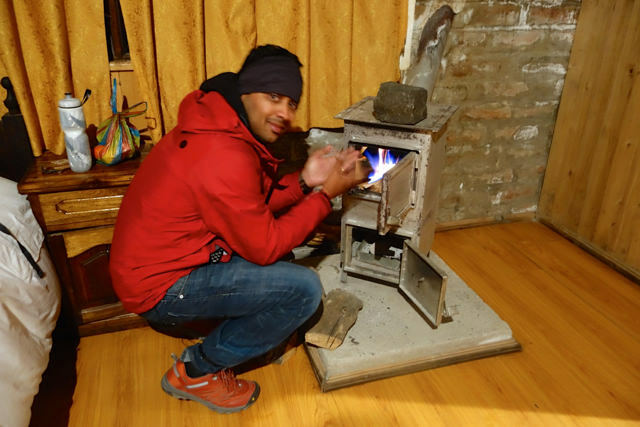 We had a nice room with a small chimney for heat. Next morning, as planned, we got up at 7:30 am and had a nice heavy breakfast. We then started our hike down Quilotoa Loop. 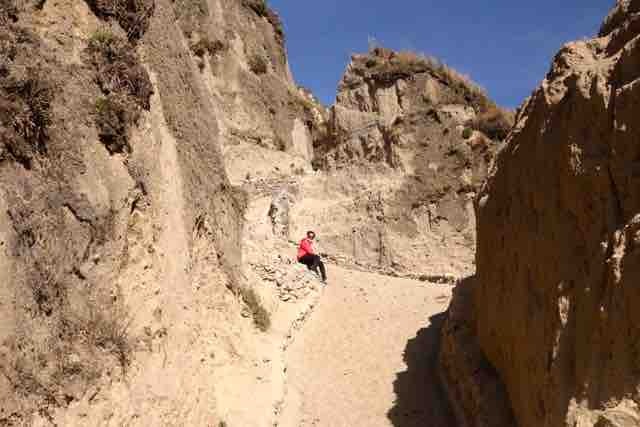 It's a steep hike with sand all along the path which makes it difficult to walk back up. They also have an arrangement where you can hire a mule to bring you back up. Unfortunately, that day there were no mules available. 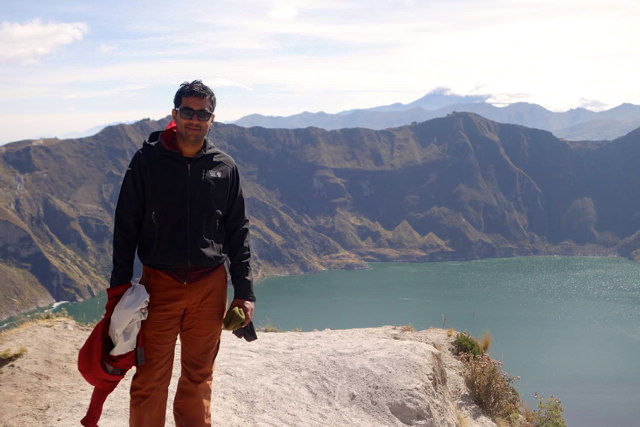 Saurabh and I decided to do it halfway, as we were more interested in looking at the awesome lake views from the top. 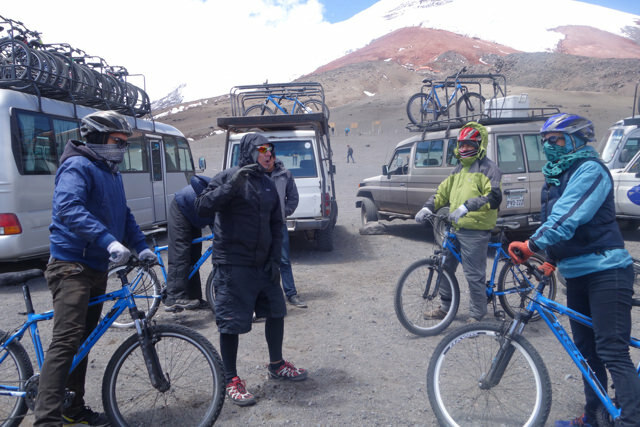 Once we were done with the hike, we started biking to Zumbahua. 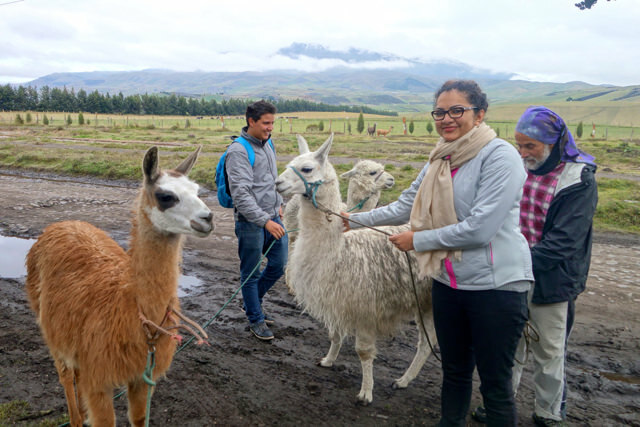 Zumbahua is a small Indian village in Cotopaxi Province located around 4 hours from Quito. 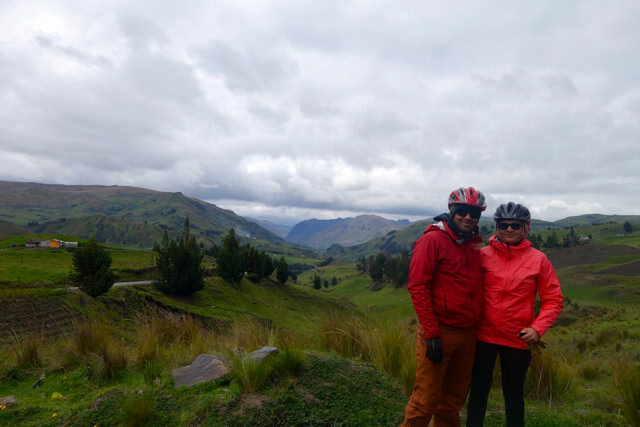 We stopped to take a few pictures at one of the canyons and then rode our bikes around villages where we saw farmlands with sheep and Alpacas. We then stopped for lunch and started biking for Latacunga. Latacunga is the capital city of Cotopaxi Province and is located at approximately 2700 meters above sea level. Our third and final day started in an unusual way with the Alpaca waking us up at the break of the dawn. 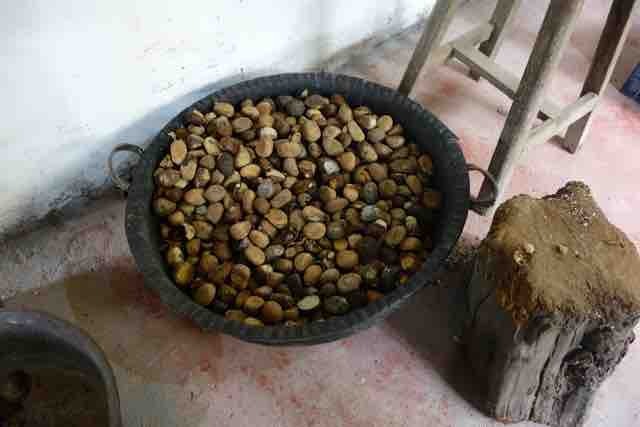 Rodrigo Donoso, the owner of the place, introduced us to his pets. They were very adorable. 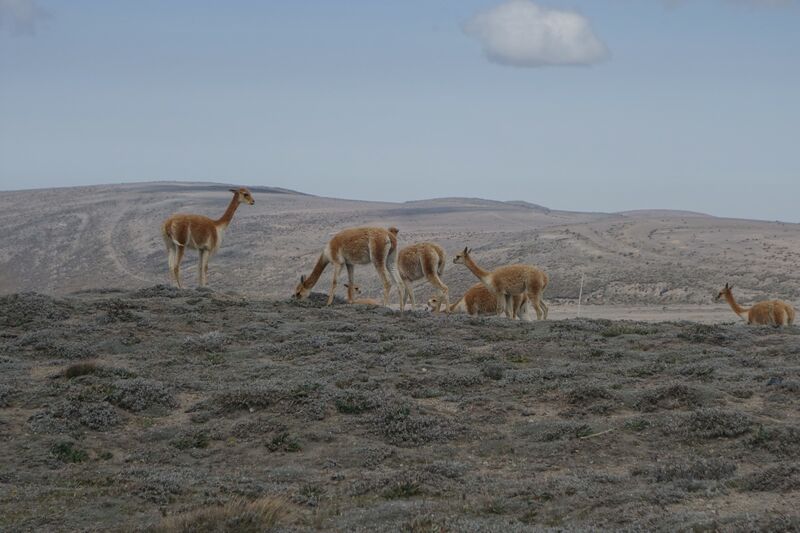 However, the owner warned us to be careful as the Alpacas spit at you when they sense danger.He then showed us around the place walking us through the vegetation of the place as well as the local artwork. He gave us a small demo about his workshop where they made artwork out of Tagua nut which is a seed of a tree that looks like a dry coconut. 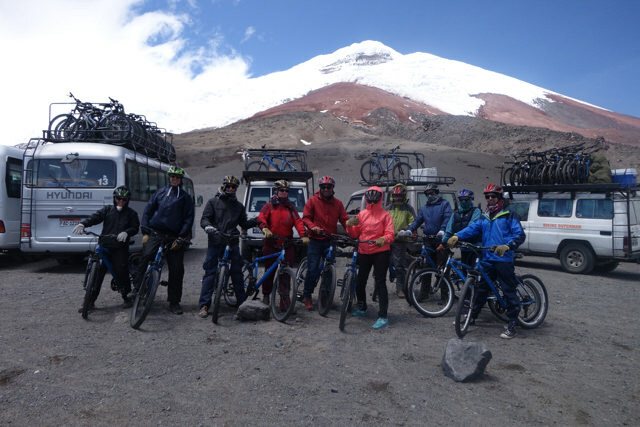 We all bought small gifts from the shop to support the locals and headed for Chimborazo Mountain for our final day ride. 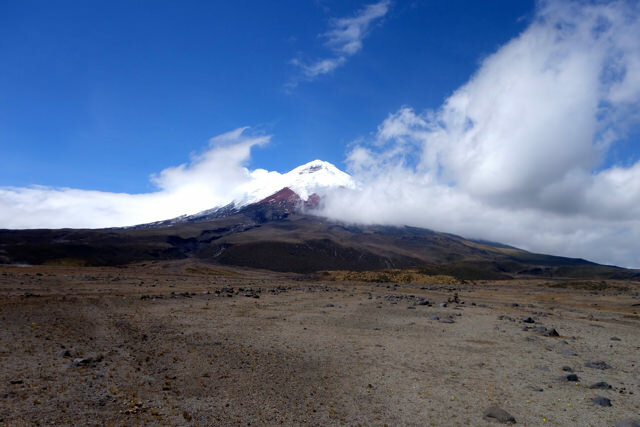 After reaching Chimborazo, I started feeling a little light headed at an altitude of 4800 meters. 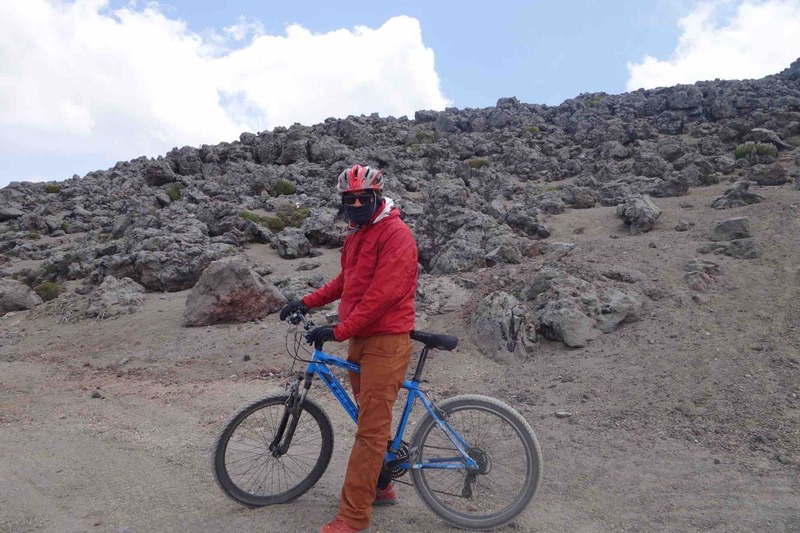 Next, we started our ride through rough volcanic rocks, heavy gravel, and sand. 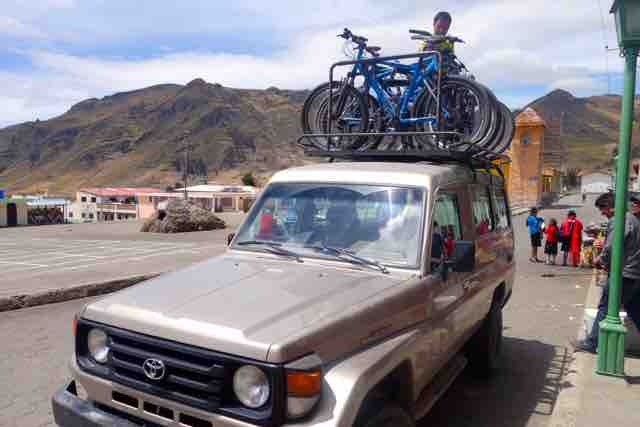 We drove to the start of the park entrance, put our bikes back and headed for our final stop - San Juan. 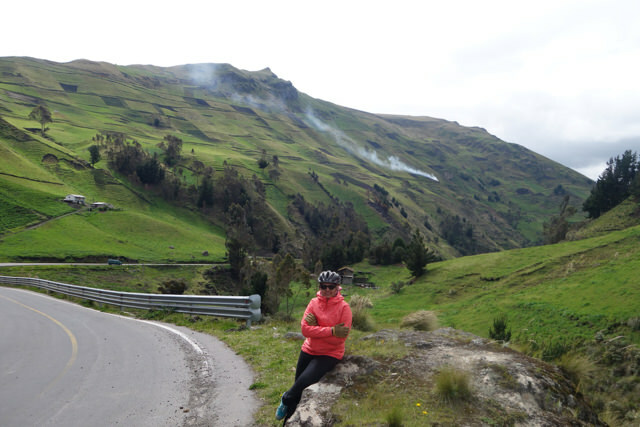 The view in this last ride was gorgeous — lush green mountains and waterfalls surrounded us throughout the way. This time the terrain was flat paved but windy road. 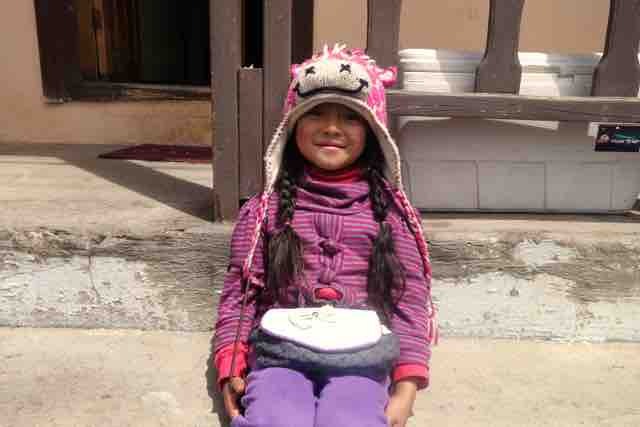 We finished out the third day a bit early than our scheduled location Ambato as we were getting late for Quito. Finally, after driving for 3 hours we reached back to our starting point — Magic Bean. 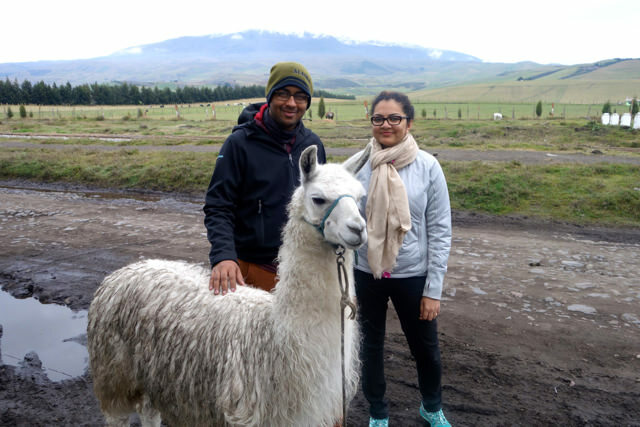 These 3 days were really amazing for both Saurabh and me as we made a lot of friends and came to know a lot about the culture and heritage of Ecuador. Looking forward to creating more stories like these for the rest of our trip.